Reinforcement - The larger the metal angle, the more stress and weight it can bear. When angles are bolted or welded to the corner of anything being constructed, this increases its ability to bear stress and enhances its longevity. Support - A common use of metal angles is as a bracket support for shelving, usually attached to the wall at a perpendicular angle. Angle irons are useful in bracing joints and in holding different components in place. Framework - Metal angles are a basic component of nearly every construction project. From buildings to factory machinery to beds, steel angles are used to provide a strong framework. Decorative - Steel angles are not always hidden in construction. They are sometimes used decoratively as trim on the edges of furniture and in building interiors including doorways, counter tops and floors. The 6061 Aluminum Angle is the most commonly used aluminum for structural applications. It has great strength and is the angle of choice when light weight and corrosion resistance matter. This angle is easy to weld, cut, and drill. Aluminum Angle 6061 is resistant to stress cracking and non-magnetic. 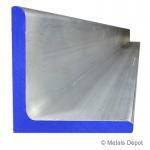 Shop for Aluminum Angle - 6061 Online! The 6063 Aluminum angle with its sharp angle corners inside and out is often used where strength is less important than surface finish. It is routinely used for trim applications. Its light weight and corrosion resistance make it the ideal product when this is of concern. 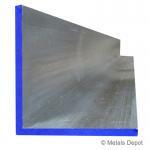 Shop for 6063 Aluminum Angle - Sharp Corner Online! Shop for 304 Stainless Steel Angle Online! Shop for 316L Stainless Steel Angle Online! 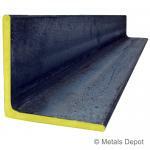 The A36 Steel Angle with radius corners is used widely for structural applications, general fabrication, and repairs. It cuts, welds, forms, and machines easily. 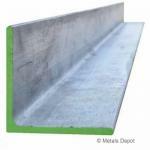 This product is available in galvanized and non-galvanized steel. Shop for Steel Angle Online! 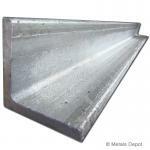 Shop for Steel Angle - Galvanized Online!